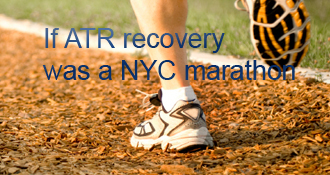 badtimingjoe has completed the grueling 26.2 ATR miles to full recovery! Hello all. I haven’t been on here much the last few weeks, as things are progressing well for me, and I sometimes forget about my surgery and the recovery process. I’ll just point out some milestones I’ve hit and would love to hear comments on whether or not I’m pushing things too fast. 1) Back to golfing! I was cleared to play “flat footed” around 9 or 10 weeks, but my first time out was at 11 weeks. It was great! My swing needs some work, but my foot felt mostly good. Only issue was the my scar tissue was still healing, so my spikes rubbed it and made it uncomfortable towards the end, but that’s now gone done. I’ve gone to the driving range a few times since, and it feels great! 3) Started jogging (slowly) at 14 weeks. My PT said I could jog when I felt like my strength was up and I wasn’t limping. I’m going slow, but I jogged about a mile at a 10:30 min mile pace. I’m watching my footing, but it feels nice to just do something a little more normal. Definitely not running, but it feels like a whole new world now that I can at least have both feet off the ground at the same time. 4) Two weddings with lots of dancing and zero discomfort. 5) Slowly getting two single footed heel lift. Right now I’m still 100% supporting myself, but I can feel the strength coming back bit by bit. Overall, I feel really lucky at how everything is going. I know many people have complications and recovery is definitely hard, so I am trying not to take anything for granted. I’m very happy with how things are going. Hope everyone is having a great summer. For those just starting the journey - it’s long and hard, but there is hope! It’s hard for me to believe that it has been almost 10 weeks since surgery and 12 weeks since I ruptured my achilles. On one hand, it is a very slow recovery process with incremental improvements week over week, but on the other hand, it does seem to fly by and those early memories of being laid up 2 weeks and the miserable 3 days of pain post-surgery are distant memories. In general, I feel very fortunate to have had a great recovery process thus far. I haven’t experienced many of the complications that others mention; I’ve had minimal swelling (haven’t iced since week 5), I was in two shoes at 6 weeks and got through the transition slowly but well, I removed the last heel insert last week so I feel somewhat “free” from shoes in doors and the type of shoe I can wear… Generally all good things, which I’m trying not to take for granted given all the complications I’ve read about and hard recoveries others have had. Just wanted to write a quick update from the past 4 weeks. Apologies for not writing more for those that are looking for recovery paths and some good news to look forward to. I moved from the walking boot to two shoes at 6 weeks. I had 3 inserts in my right shoe and was instructed to remove one insert per week for 3 weeks. Learning to walk again was much harder than I thought it would be. I looked like a grandpa and would flinch any time someone got too close to my foot. Walking into the grocery store to buy groceries was like walking into a war zone for me - My head was on a swivel, as I could see someone inadvertently bumping into me with a cart. Luckily I got through that trying experience. I started PT in week 6. My PT started with very light ROM exercises and focused on massaging the scar tissue / achilles. It felt great. As I mentioned, my walking was very slow to start, and I had to go down stairs one step at a time because of how tight my foot felt. My PT said this was all normal and encouraged me to take it slow but also to keep up the ROM exercises every day. I saw significant improvements the last 4 weeks. I feel like I’m walking mostly normal. I can sense a little limp, but most others cannot. It feels great to just be able to walk around! Stairs are pretty normal – I went to a baseball game and had to walk down to my seat and was able to generally keep up with the flow of traffic. I would not have been comfortable trying that 2 weeks ago. At week 8 I was cleared for light stationary bike exercises and for some hip strengthening. Last week the PT said I was ok to swim if I wanted as my wound was almost entirely healed up and she felt like the risk of infection was pretty low. For those wondering, I was also cleared for golf at 8/9 weeks but told it’d be flat footed and to be careful where I stepped. I am going to try a round next week, but I’m excited about that. The only small issue I have is that shoes with low “backs” to them, e.g., my tennis shoes and sperry type boat shoes have been rubbing on the bottom of my scar and bothering it. I’ve been wearing more low-calf boots for work to alleviate the constant rubbing of walking around. For those just starting the process - It’s definitely long and trying and I know I’m nowhere close to the end, but there is hope! One thing I cannot wait for is for people to stop asking me, “So how’s the foot?” and “Hey, looks like you’re walking better.” - I know people are just trying to be nice, but for some reason this is bothering me so much because it’s the same answer every time, and it’s a constant reminder. I know it’s my own personal issue, but I can’t wait until those questions/comments stop. 6 Weeks and 2 Shoes? I had my 6 week post-surgery check-up yesterday, and my doctor put me into two shoes with a heel lift only in my right shoe (ruptured side). The heel lift has 3 separate lifts stacked to 1/2″ or so I think, and I was instructed to take out one lift each week. My doctor said I healed very well and that he’s very happy with the progress to date. I was FWB after 4 weeks with a 5 degree plantar flexion / dorsi flexion in the boot, so I’ve been “walking” for 2 weeks. Two shoes is an entirely different ballgame though. I’m very nervous about a re-rupture, so I’m taking it pretty slowly. Walking slowly, one step at a time upstairs to my bedroom, limited stretching of the achilles as I’m walking, etc. 6 weeks into shoes seems pretty fast based on the different blogs I’ve read, but my doctor was pretty confident I was ready. I start PT tomorrow and I’ll be doing 2 sessions / week for 4-6 weeks. Next appointment with my surgeon is at 12 weeks. Wanted to get the communities take on something - for showering and going from the bed to the bathroom (maybe 25 feet), I’m not using my shoes and just going bare foot. I walk very slowly, but get in and out of the shower without shoes. Is that what others have done as they’ve been moved into shoes? I’m planning on buying “house shoes” so I can move the heel lift into something easier to get on and off. Overall, I”m very excited to be in 2 shoes, and I’m cautiously optimistic. Thanks for all the comments and guidance. Always helpful to hear how my doctor’s protocols compare to others out there. Saw my surgeon 5/28 for my third follow-up appointment. I was told everything looks great. There was a small issue with my boot (some bending), but they fixed it and changed it to 5 degrees plantar flexion (I think). I was told I can put as much weight on it as I can bear and when I feel comfortable, I can stop using crutches all together. Great news as I hate crutches! So far so good. It was nice to be able to make dinner and not worry about putting too much weight on the foot. I still have swelling at night and keep it raised when I sleep. Any thoughts on the timing of the recovery and my doctor’s protocol? Does this seem overly aggressive or is this following some of the more recent literature on getting back to normal as quickly as possible? I still need to figure out these widgets. I’ve been meaning to write this for awhile, but once I got back to work, things have been moving so quickly that I haven’t carved out the time to fully write this out. My quick statistic: 29 year old male, I’d say I’m in generally good shape. Before the injury I was doing Crossfit twice a week, playing basketball once every week or two, and yoga the weeks I was too sore from Crossfit or basketball for a third workout. I’ve been married for 11 months, and before the wedding was in the best shape of my life, so not that far removed from a more rigorous schedule. I usually run a half-marathon once a year and a few 10ks. I’ve run one full marathon – best/worst day of my life. So, in general, active. The day before the injury: My name “bad timing joe” comes from the fact that the day before the injury, my wife and I signed to purchase a house and close in 4 weeks. A very exciting time for us, but I quickly found out how fast things can change. Second follow-up: May 13 – removed splint, removed staples, put into walking boot at 15 degree inflection. Told to “toe tap” to get the feeling of swinging my leg with the crutches for May 13-May 20. From May 20-third follow-up I was told to put 25% of my weight on my boot. The day of the injury: I think I jinxed myself. The morning of the injury (a Saturday), I was feeling pretty good and thought it would be fun to get together with friends and play basketball. I had actually stopped working out for a week because I had some lingering knee pain from Crossfit, but I did stretches/squats in the morning and a few lunges to see that everything felt good. Before I left the house I told myself, “I just cannot get hurt right now. That’d be the worst timing I could imagine.” – So yes, completely jinxed myself. When at the gym, I stretched extra (20-30 minutes of stretching) for the very fact I didn’t want to get hurt. The prognosis: After consulting WebMD and 3-4 other websites, I knew it was a torn Achilles. The “pop” feeling like I was kicked in the ankle, and even the lack of pain all pointed to it. I was so upset with myself. Luckily I live close to a very good orthopedic center, so after calling my sister-in-law (a physical therapist) to get her opinion, I went into the center. Meeting with the surgeon: I met with the surgeon 5 days later. He was a bit more open to non-surgical, but highly recommended surgery based on my level of activity. We reviewed the MRI together and he noted a complete tear and showed me the gap. It seemed like a small gap, but I don’t MRIs. He quoted a “30-40% more likely to re-rupture in the first year” statistic, and he reiterated the longer healing time. Given I wanted to get it done and enjoy the summer, I opted for surgery. Surgery Day (12 days post injury): I wanted surgery to happen sooner, but my surgeon was completely booked. He’s been doing the surgery for 20 years and had great reviews. The local orthopedics center manages all of the Minnesota sports teams, so I wanted to stick with him, but I was a little frustrated by the timing. 1-day post surgery: Worst pain of my life. I set an alarm for 4am so that I would wake up and take my next dose of Norco. I didn’t make it that far. The pain woke me up at 1am. Hard to describe it as anything more than feeling like a knife was cutting directly into my heal. I quickly popped 2 more pills with little benefit. I was awake from 1am-7am with the worst pain of my life. Looking back, I wish I would have started taking Ibuprofen right away for the swelling. The entire day is a blur looking back, but I was popping as many pills as was allowed and just trying to sleep the pain away. Norco (which is similar to vicodin I think) definitely made no impact for me. For future surgeries (hopefully I have none) I will demand Percocet or something stronger. Week 1 (0 – 7 days post surgery). I was told I could shower and move around to get food, but to keep it elevated at all times after that. I was probably too active. I was staying at my parents house because my wife had to work, and went home on Saturday. I was so ready to get out of the house that we stopped for lunch and bought a fan for the new house at Menards. I was definitely moving around without it elevated for a good 3-4 hours. I stopped taking vicodin 4 days post surgery. It was doing nothing for me. Was told everything was healing really well. Swelling was low. My hard cast was taken off (it was more of a splint) and a new removable split was put on. I was told I could take the splint off to shower but to keep it on other than that. No driving, lots of elevation, and rest were still required. I started working the Monday after surgery (surgery was on a Wednesday), because I can work from home from my computer. Was good to keep my mind off of my lack of mobility. Uneventful. I was able to shower without a bag on my foot which was nice. Other than that, a lot of sitting with the foot elevated as much as I could. I left the house a few times with my wife for dinners, church, and other 1-2 hour excursions. Was told everything looked really good. The doctor tested if I could push down at all, which I could. A tech removed the staples, and I was fitting for a CAM walking boot. They angled it at 15 degrees. I was told I could take it off for showering and sleeping, as long I wasn’t a “violent sleeper” and would kick or jump up in my sleep. Luckily I am not. Week 3 (14-21 days): Very light touching down of my toe as I’m walking with crutches. “light tap” to get the movement of walking in. I followed this pretty closely. I had some bleeding from the incision. I don’t know if it’s because they took the staples out too early or if this is just normal from an injury. It only lasted a day or two. Week 4 (21-28 days): 25% of my body weight while walking with crutches. I started out at 25% and was pretty good at following this. At first it felt uncomfortable, but I quickly got the hang of it. We were moving into our new hours at day 25, so I was anxious to be able to put more weight on it. I definitely started to push the limits, occasionally walking without my crutches for very short distances, standing in place without my crutches, even helping to move a table (mostly forcing the weight onto my non ART leg and using my arms). I’m hopeful that I haven’t pushed things too fast too quickly. It just feels good not to walk with crutches. I’ve put very light weight on my barefoot (again, just to steady myself, no real weight). It definitely feels good to put a little weight and to feel that the Achilles is actually working. Third follow-up is today (28 days post surgery). I will write another blog post after my follow-up today. I just didn’t want to wait any longer. Overall, I’m feeling very hopeful for my recovery. Everything seems to be going great. While I don’t necessarily feel the “surgery is the only way” advice I was given was right, I’m glad I went with one of the best orthopedic centers and a surgeon that knows what he’s doing (at least I think he does). Thanks! Moving into two shoes was the biggest step, and I saw significant progress the first few weeks after that. My doctor moved me to two shoes at 6 weeks, so it was slow going for a few weeks. However, it feels great when you see the day over day progress. Don’t push yourself too hard, but definitely do all the PT exercises you can. Every time I was sitting I was rolling my foot in circles and doing the alphabet. One day at a time! Great and well done, sounds like you are making good progress and are enjoying it!! That sounds like great progress! Must be good being back to golf and yoga. You’ve certainly hit a variety of milestones. Good luck with the rest. There are (much) longer versions, but that’s the gist. Your injured foot rolls over the step, needing no ankle flexion at all. Works in a fixed boot and also in 2 shoes. As long as you can walk FWB, you should be able to walk down stairs full speed that way. Walking down stairs completely normally, with the foot back against the riser(?) and fully loaded while dorsiflexing a LOT, is a very challenging move during ATR rehab. This trick changes that. I saw it as a comment on one the blogs. Would add that Norm’s tip re stairs is invaluable. I did the one step at a time for a day but then read the tip here and haven’t looked back since! Sounds good. But you could have skipped the 1-step-at-a-time walking downstairs with a trick I’ve posted here maybe a dozen times. Its worked for almost everybody who’s tried it. All sounds good - congratulations! You and I are at almost the same spot. I have found swimming to be very helpful in improving ROM. I also did several rounds of flat-footed golf last week. I used KT Tape to stabalize my AT and also rode in a cart. It was fun and, with my abbreviated swing, never spent more time in the fairway! Hi Joe, Great to hear that you are moving into 2 shoes. I moved from boot to shoes at just over 6 weeks and didn’t have a boot weaning period. I was, of course, very careful and slow but did well in my recovery, this was over a yr ago and you can find my blog on here somewhere. I did carry on sitting in the shower on the stool I brought, but like you walked barefoot across the bedroom only. I wore trainers indoors initially with both heel lifts in, this was all as advised by the orthopods ( I was non op). ATRbuff - certainly not cross, just a little confused. Don’t mind being told I am wrong either just like some substance as to why. Happy to leave it at that. No debate Stu. I just thought that your post needed a little clarification. Certainly no need to get cross, and not the ‘house style’ for Achillesblog. By the way, I’m not being biased towards the younger quartile either - I’m over 60 myself and went non-surgical after a 100% rupture. Progressive OS. Now, my mountain calls - a hard day ahead, and no cell reception anywhere near there. ATRbuff - Not sure what we are debating here or why. Is it that I am completely wrong or is it that age is relevant with regard to early weight bearing and mobilization. Accepting the fact the studies had a range of age then it included older people and mostly middle aged. Tell me how I should word it to satisfy you??? “A mean age in the 40s” - doesn’t really mean middle age or older does it? Can’t it equally mean middle age or younger? Maybe it is on your page somewhere together with upper and lower quartiles, median and all the rest of the statistical hokum (i know, I know, it is valuable research data) but as I’m just off out to go climbing I don’t really have the time. ATRbuff - there are 2 links on may page to studies on early weight bearing and both show a mean age in the 40’s. Google this web site for another achillestendon.com/achilles-tendon-rupture/ or go to achillestendon.com. I am not sure how many references you require. Of course when they carry out research they use patients who fit the requirements or guidelines. Age may not be one of those but as this injury mostly occurs in middle age and older people (search ‘mean age achilles tendon rupture’) then it follows that most the participants in the research will be in that portion of the bell curve. There is also reseach showing age does not affect tendon healing. Hope this is helpful. regards Stuart. Joe - Forgot to mention, did you do any physiotherapy when you got your boot? My doctor told me I didn’t need it. Joe - I probably follow some what of your protocal since I’m not ready to put weight on my leg because it doesn’t feel right when I do. I’m guessing I will put into shoes in 6 weeks too, because that’s when my next follow up. Stuart / Akrose - My first blog post has my overall timing, but I’ll provide a quick summary here. - Put into shoes at week 6 with a heel lift. I’m walking cautiously, but not using crutches at all. Apologies, should have written ‘mostly done on middle aged…’. Where did you get the idea that research into these protocols is done on middle aged and older people? From my reasonably well informed viewpoint it would seem that your statement is completely wrong, with the data typically being collated from all atr patients over a set period of time. Perhaps you could follow up with your reference points? Gosh, I’m at 11 weeks and still not fully weaned from the boot. I’ve had a really hard time wearing shoes due to the swelling I still have. Also, I have an anchor in my heel that rubs a shoe uncomfortably. I limp pretty badly when I do wear two shoes. I don’t think I could even do FWB in the boot at six weeks….I mean, I tried, but couldn’t really manage till 8 weeks. Anyway, take it easy. It’s not a race. But I’m glad you’re doing well. Arkose - I take from what you have said that your doctor has told you to take all your weight (FWB) on the foot as you walk but in reality many of us progress from partial WB to full using the crutches to take some of the load. No crutches equals FWB. This transition does not have to take long and depends really how much it hurts. The more you do the less it hurts which doesn’t mean go out and do more until it doesn’t hurt. As tolerated is the word we use. Some people can tolerate more than others so it may be quicker for them to FWB. Overdoing it and pushing through bad pain doesn’t necessarily make you heal quicker either. Stuart - Thanks for replaying. Yes the doctor told me I could move my foot up and down slightly to neutral when I’m on the bed or sitting, without the boot. When my doctor said I could walk without my crutches, did he mean I can put my full weight while walking? Of course no weight without the boot on. Greg and Arkose - Age is not as much a factor in healing than most of us would like to think with this injury. There would be some small advantage to you because of collagen production but I doubt it is significant enough. I would suggest your doctor is following a more modern protocol that has focus on early mobilization and weight bearing. My father is in his mid 80’s, went non op and was weight bearing from day 1 after his rupture. Most of the research into these protocols are done on middle aged and older people anyway. The important thing is to do it as tolerated (pain and swelling) and only with the boot on until instructed otherwise. Rest, elevate, ice as required. Were you also told you could commence some gentle movement of the joint with your leg supported? No call for worry at the moment as it seems both of you are on the fast track to recovery. Read much and learn much as this knowledge will help you know what to do as much as what not to do. Yes this is also my first posting. I ruptured my achilles exactly like gregbaker, and I’m 21. Had my surgery on 29th of May, and had my follow up on June 10th. I was put in a boot june 10th on my follow up also he put in 2 heel lifts (2 inches). My doctor said I could start walking without my crutches with my boot. When I got home, I did some research on recovery and found this site. I read many blogs of recovery saying they started walking after 4-6 week after they got out of their cast and put in the boot. Its only been 2 weeks for me and I am already allowed to walk in a boot without crutches. Is it because of age? My doctor did say I ruptured my achilles at a young age and said I had healthy achilles tendon. Is it to early to walk? Is it normal? Any one had the same experience? Any help will bring my worry’s down. Thank you. Hello all, this is my first time posting on here, I’m looking for some good insight from all you guys. I ruptured my achilles playing basketball on 5/17 and had surgery on 5/18. Today, I got out of my cast and into a CAM boot. He said it would be 6-8 weeks in the cast but he said it was beautifully. I might add that I am an outlier being that I am only 20 years old. He said i should use crutches another week but I really don’t need to. I tried putting pressure with the boot on and my brain just didn’t respond as its a mixture of nerves and not feeling physically able to do so. Can you guys give me some advice how to navigate swiftly with this boot and any other advice you guys may have. I appreciate it. 6 Weeks is early. At 8 weeks, many good protocols do shoes, often with no wedge. For the wedge crowd, I’d assume that wedges in BOTH shoes would give better hip and spine alignment. Worst risk from shoes at 6 weeks may be that you’ll be over the Watch Your Step nervousness by ~10 weeks, before the rerupture risk is over. Stay nervous! The alternative is to use the boot some more, hinged all the way toes down, but restricted in the DF direction at a safe angle. I used neutral, but it sounds like you were comfy at 5°DF. Many people WEAN off their boot gradually in any case, either tapering by hours/day or shoes at home and boot in public, etc. I think as a general rule you can’t really go wrong attending as many PT sessions as your time/finances allow for, particularly in the early weeks. While it might be a case of diminishing returns in terms of impact on long-term recovery, having access to things like massage and other anti-swelling modalities that you don’t have at home will at a minimum increase your comfort level, so it certainly won’t hurt to go. If you’re constrained as most non-pro-athletes are, then it becomes a question of bang for your buck. As others have mentioned, a lot of the strengthening work for this injury can be done at home without any supervision beyond the initial instruction phase. It’s unlikely that you’ll need to supplement this instruction at intervals under one week, so you’ll be covered on that front by making weekly visits (and even longer, in the later stages). If you can maintain that schedule and squeeze in a few more sessions in the early weeks to help with the initial swelling / restricted movement, your leg will probably appreciate it! Professional sports teams have a full staff of PT’s who are paid to provide these services daily or twice daily to help get the team’s assets back on the field ASAP. For those of us who have insurance which provides for anywhere between 20-40 PT sessions for an injury such as this, or those without insurance at all need to figure out a good schedule with your OS or in my opinion, the PT’s themselves, that work for you and your benefit allotment. For example, I started PT twice weekly at 3 weeks and found tremendous benefit from it. youngrfpc - how often should you go to PT? How much can you afford? My PT told me that she was there to provide the information but in reality it was up to me to do it so I did PT every day but only saw her once a week which became once a fortnight then once a month. She would check my progress and guide me through the stages of rehab. There are some machines and devices PT’s have access to which can be of benefit but most of it can be done at home. I had a fantastic result and very quick without any fancy machines. Just hard work and follow the advice. I tore mine and had surgery just over 2 weeks ago. I started PT this week and my PT mentioned that he had worked for an NBA team that would be treating a player with similar injury twice daily from the 2 week period on. Norm or anyone, is there any consensus on what amount of PT per week is recommended for most people? I am trying to follow the accelerated rehab with Vacocast protocol which seems somewhat similar to what Joe is following. Just shows what can be achieved by someone as fit as Bryant and with the level of attention that he would have had from a team of medics, physios and bag carriers. 6 weeks into shoes does sound a little on the speedy side of things, but not completely unheard of. For reference, Kobe Bryant had his ATR surgery on April 13 and on May 30th tweeted a picture of himself walking 2 shoed on an alter-g treadmill (reduces impact by lowering bodyweight similar to walking in water). Might it be possible that your doctor will tell you “shoes at home / on grav treadmill at PT / boot outside” starting week 6? Shouldn’t be necessary. In their line of work, surgeons should be pro-active in seeking a better way forward, researching, discussing and networking with colleagues around the world. At present it is members of communities like Achillesblog who basically do this for some of them, and are regularly dismissed with “don’t believe everything you read on the internet”. How many US orthopods have read up just lately on the evidence supporting non-op treatment? Most of the recent top stuff has been from the UK which one regular blogger here once described as a ‘backwater in ATR treatment’ or something like that. That person has changed their view now but I wonder how many ’specialists’ still have that view and only consider old, anecdotal data. Norm - Can I bring you to all my follow-up appointments? Thanks for the info. Absolutely! I’m going to bring in some of the other protocols to my doc. As many others have mentioned, it’s a pretty delicate balance with doctors, which it shouldn’t be. You don’t want your doctor to feel like you’re “second guessing” them per se, but at the same time, you want the best possible outcomes for yourself. I’m a big supporter of evidenced based medicine and technology that is trying to automate this for physicians (IBM Watson for example). Physicians tend to do what they know and there’s so much “new information” being created every day, it’s incredibly difficult for them to keep up. If a technology like Watson (or many others that are trying to come into the market) can take some of the guesswork and provide actual recommendations, hopefully physicians will embrace this. Imagine if the doc/nurse could put in all the information (Joe is 29, complete rupture, 4mm gap, very active, wants to return to sports, no other injuries, preference for non-surgery) and get 2-3 recommendations with likelihood of success (non-op 98% likelihood for success, op-99%, etc.) in a matter of minutes and be able to show this to the patient? Thanks for the nice response, Joe. For sure, you should embrace and enhance your post-op recovery with no regrets, and I will enthusiastically join the rest of the gang here in trying to help. But if you can carve off a bit of yourself to help make sure the next (100?) ATR patients don’t get a terribly misleading presentation of their options, it would be a Good Thing. I completely agree on your take for the first surgeon I saw during my initial acute care visit immediately after rupturing my achilles. However, I will say that Doc no longer does surgeries and stays involved in the acute care clinic just as a way to stay active. He’s very old school. To your point, it might be good for the clinic to get him up to date on the literature. My actual surgeon was extremely competent and did a better job of laying out the options and discussing the recent developments in the non-surgical path. He didn’t point me to the recent studies between op and nonop, so that is a gap, but I think you’d find that everywhere. That’s an issue with the healthcare industry in general. Look at all literature on healthcare and it’s not shocking that surgeons recommend surgery… I’ve been very happy with my post-surgery recovery. I would have preferred avoiding surgery in the first place, but that’s something I can’t control now. Given the BS your prominent surgeons told you, Minnesota’s health care must be more backward and primitive than I’d thought. Sad, for all the active folks in MN. At least it sounds like they’re more competent at doing the surgery than following the literature and summarizing the evidence and getting INFORMED Consent! I sure hope so. If you can do anything to drag them into this century, you’ll be saving a bunch of future ATR patients a lot of money and some pain and time off work. Several of the best papers they haven’t read are on this site or linked from it, e.g. from AchillesBlog. com/Cecilia/protocols. badtimingjoe’s AchillesBlog is proudly powered by WordPress and WPDesigner..